A Wheel Alignment is part of regular vehicle maintenance to ensure your vehicle is tracking straight. Proper alignment means a smoother, more pleasant driving experience and also saves you money. Does your vehicle pull to one side, or are one or more tires are showing signs of uneven or premature wear, you may need a wheel alignment. Hyack Excel Tire’s experienced auto techs can perform a wheel alignment on any modern car or light truck. How frequently you need a wheel alignment will depend on the type of vehicle, it's age, it's condition and general wear. These are the typical events that cause your wheels to become misaligned. The reasons to to order a wheel alignment is to improve vehicle safety and to ensure tire longevity. If you notice any symptoms of wheel alignment problems give us a call, we’ll schedule you in for an appointment. Cause of Misalignment - Why would I need a wheel alignment? All the above-listed events can significantly affect wheel alignment. If you have a significant impact with a curb, encountered a large pothole at full speed or have otherwise jarred your wheels you may have thrown your alignment out. Come in, and we can check it out for you. 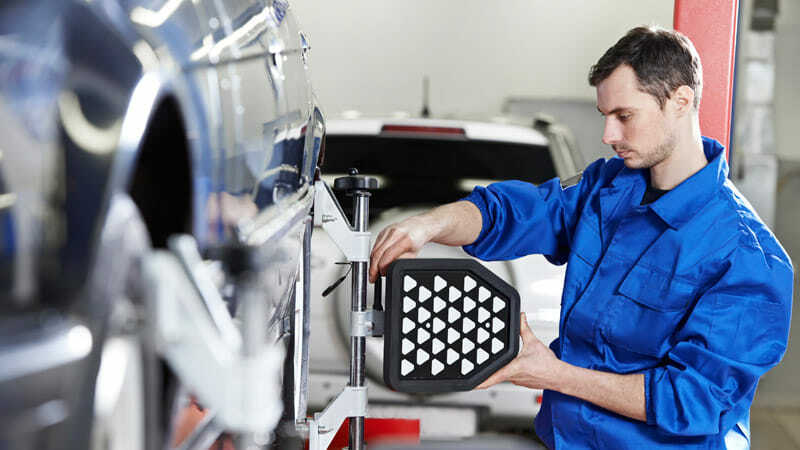 Benefits - Why should I get a Wheel Alignment? Poor alignment can shorten a tire’s life by thousands of kilometres and compromise very crucial steering and suspension parts. Replacing these parts will cost you extra money. Have your wheel alignment checked with every other oil change or at the first sign of uneven or premature tire wear.